I'll be discussing my research at two public events this month. I will be giving a talk about the role of medical discourse and social movements in the emergence of 'trans' identities during the 20th and 21st Centuries. I will be taking part in an LGBT+ History Month panel on the British health care system as , alongside Morgan Potts, Amy Clark, Ray Filar and Tschan Andrews. Our respective talks will be followed by a Q&A session. So, I've been a bit quiet on this blog since June. I have been very busy, however - finishing my PhD! I'm very pleased to say that I passed my viva last week. I will be talking about mistrust in healthcare settings, looking particularly at the context of assessment appointments are Gender Identity Clinics. This event is aimed at LGBT doctors, dentists, and health researchers. >>> Registration and more information can be found here. I will be taking part in a roundtable discussion on the practice of public sociology, with Maddie Breeze, Ipek Demir and Lambros Fatsis. This event is aimed at 'Early Career" Researchers. I will be talking about the role of 'expert' knowledge within trans healthcare and activism over the past decade. This event is being run by and for trans people, but is open to all. 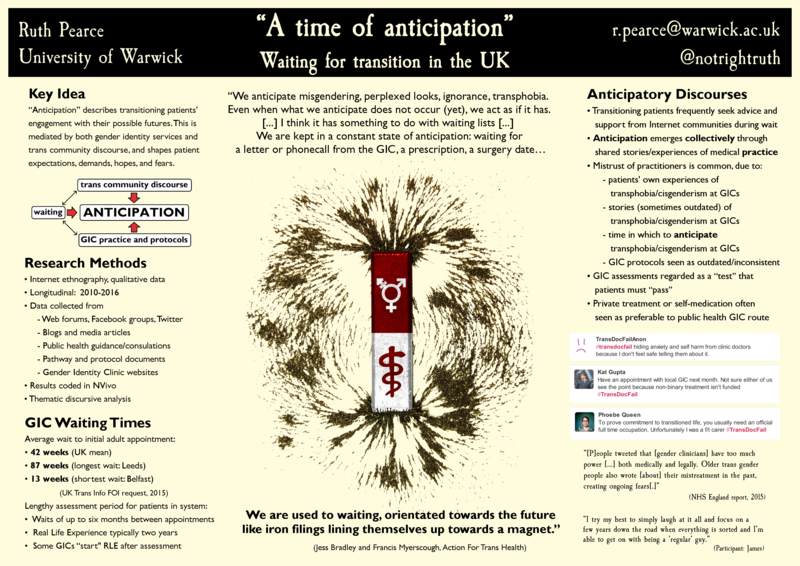 WPATH 2016 poster: "A time of anticipation"
It's very important to note that the majority of research participants had good things to say about the health professionals who helped with their transition. However, there is also a high prevelance of transphobia and cisgenderism within medical systems and clinical pathways. Anxiety and mistrust of practitioners within the trans patient population is endemic, and this is compounded by long waiting times. I'm delighted to have been invited to talk about my research at the re:publica conference on the Internet and Society, which takes place in Berlin from 2-4 May. I'm currently in the final stages of writing up my thesis, so this is a very exciting time to be talking about my findings. At re:publica, I'll be focusing upon findings related to the 'discursive clashes' that occur when doctors and patients have very different ideas about what it means to be trans. Over the last three decades, the Internet has fundamentally changed what it means to be transgender. Communities have formed over great geographical distances, and new possibilities for transgender identity and embodiment have been forged. However, transgender people continue to face a great many difficulties in everyday life, most of which stem from experiences of discrimination, harassment and ignorance in the public realm. One area of key concern is that of healthcare provision, where transgender people across Europe still report being treated inappropriately or denied services. Transgender health is frequently understood in terms of individual want: specifically, the expressed need to ‘transition’ from one gender to another. What can we find when we look beyond individual transition, to understand transgender health as a wider social phenomenon? This session will draw upon cutting-edge Internet research to explain some of the social processes that shape transgender patients’ interactions with their doctors. Drawing upon examples from Europe in general, and the UK in particular, it will show how misunderstandings on the part of both doctors and patients can be explained through online discussion and narratives of transgender possibility. The session will end with some proposed solutions, looking at how doctors and patients can better talk to one another, rather than past one another. I recently co-wrote a report for UK Trans Info with CN Lester. The report summarises the findings of a survey undertaken during November and December 2015 in collaboration with the Non-Binary Inclusion Project. The survey, entitled ‘Replace the GRC – but how?’ was created in response to calls for reform of the Gender Recognition Act 2004, in the wake of a Transgender Equality Inquiry conducted by the UK Parliament’s Women and Equalities Committee. >>>Read the report at UK Trans Info. We would like to invite submissions for a forthcoming Special Issue of Sexualities on the topic of ‘Trans-Genealogies: Gender, Sexuality and the Emergence of Trans'. Below please find email contact information for the Guest Editors, a synopsis of the Special Issue and advice for authors. The Guest Editors will be very happy to discuss your ideas for papers in advance of submission. This special issue of Sexualities focuses on the emergence of Trans as a growing vernacular of identity, intersubjectivity and feeling on the intersecting terrains of gender and sexuality. The issue draws its impetus from the recent ESRC seminar series: ‘The Emergence of Trans: Retheorising Gender and Sexuality’ (2012-14). How does the emergence of Trans challenge, develop or extend understandings of gender and sexuality, reconfigure everyday lives or herald new normativites? How do Trans lives and discourses articulate with issues of rights, citizenship and (complex and intersectional modes of) discrimination, health and welfare, education and popular commonsense? What challenges do Trans identities present for clinical and therapeutic practice, for gender and sexuality theory and for everyday articulations of identity and intersubjective and communal connection? Emergent themes include: narratives of ‘authenticity’ that guide clinical protocols, psychotherapeutic approaches and patient self-identifications; ‘pathways of care’ surrounding interventions and management of Trans bodies; professional discourses (educational, diagnostic) and clinical and practice protocols vis a vis patient or client experience; and ‘alternative’ therapeutic discourses and the Trans self-help context. The focus here concerns the emergence of Trans social networks, social movements and citizenship struggles, including the impact of digital technology and web based resources on gender and sexuality activism and new identifications. Key themes include: communal, popular and ‘everyday’ repertoires of body, identity, feeling and experience; the impact of digital technology and social networking, and Transformations in everyday vernaculars of gender and sexuality, everyday lives and ‘on the ground’ experiences. A third thematic focus concerns the spectacular, social semiotic, aesthetic and visual repertoires of Trans. Trans has emerged as a cross-media phenomenon involving traditional and new media from film and television to web-based media to photography to performance art, giving rise to emergent popular and commonsense dimensions of Trans. The fourth thematic focus concerns the epistemic, intersubjective and affective implications of Trans culture, discourse and practice. Key questions in this context include a) to what degree and in what terms does the emergence of Trans challenge conceptual norms across different cultural sites from professional to popular to everyday practice;and b) what challenges do the epistemic underpinnings of Trans herald for sexuality and gender studies? Does Trans, for example, represent a ‘postcloset’ epistemology? Does it represent an emergent meta-narrative and, in its wake, a Transformed ‘post Kinsey’ understanding of gender, sexuality, bodies and experience? I recently spoke about redistribution within/through academia at the inspiring BSA-sponsored event "Reappropriating Value(s) in Higher Education". The organisers have created a Storify account of social media accounts from the day, which can be read below. I've already posted about the Sexual Cultures Conference - this is now just a few days away! I'm greatly looking forward to sitting on one of the conference's keynote panels on the first day with Jay Stewart (Gendered Intelligence), Jade Fernandez (Stonewall) and Kat Gupta. The overarching theme of the conference (and, by extension, the panel) is "academic meets activism". I'm planning to talk about my move into academia from activism and my involvement in events such as the Emergence of Trans seminar series and Spotlight on: Genderqueer that attempted to speak to both academia and activism. I'll be aiming to highlight some of the limitations and drawbacks of such events as well as their strengths, and think about how future organisers might be able to build upon these lessons. The whole programme for Sexual Cultures is fascinating, and I'll certainly be dropping by as many sessions as possible. However, I'll also be popping out for a few hours on Thursday to attend a Trans* Health Workshop at King's College London. At this event, I'm planning to speak about some of the early findings from my PhD research, including reflections on the emergence and evolution of 'trans' narratives and their intersection with medical discourse.